Although I had come up with a series of starting points on the Friday of the Good Start and Bad Start Workshop, I was not entirely satisfied with them and I thought that I need a lot more in order to make a decision about the four I would look into further. That’s why I sat down and took a look at everything I had come up with on the Friday. Once I had written all of the topics down, I started filling that list with more and more topics which stemmed from each other and made connections between each other. During this process, I was mostly answering the questions “What interests me?“ and “What am I passionate about?“. It’s important to me to spend this year working on a project that I would really enjoy, and a project that would hopefully inspire and intrigue others in the topic. I want to end Year 3 with a project I am proud of and a project that represents me and my work in the best way possible. That’s why it only seemed logical to me to focus on topics I am passionate about as that would make the work flow infinitely easier. With this approach I came up with a large list of around one hundred and twenty topics, which is detailed below. The first page of notes on topics I am passionate about and would enjoy researching. A second page of topics, all amounting to about 120. However, now that I had this massive list of topics, I needed a way to pick my four main ones that I would like to narrow down on and research further. As I wanted to make an educated decision on which topics to choose, I felt like I needed a better way to visualise the data and to represent the connections between individual topics. So many of these subjects were incredibly intertwined and it made sense to me to go for the topics that had the most links and connections with other themes and ideas. This meant that I needed to go down the rabbit hole that is Data Visualisation and to pick the best methodology of representing my interests and the relationships between them. 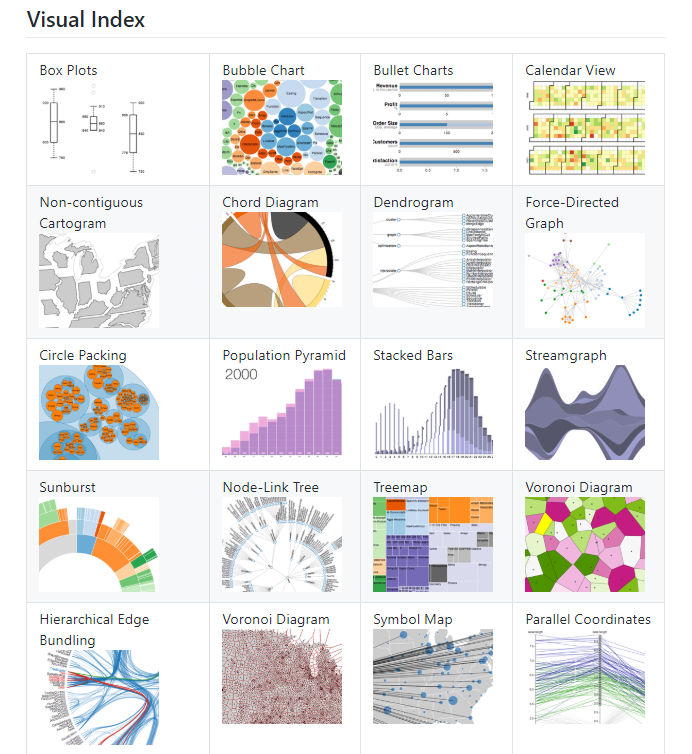 I did most of my research into Data Visualisation from a fantastic website called D3, which deals with Data-Driven Documentation. From the dozens and dozens of graphs they had to offer, I found that a tradition Arc Diagram and a Radial Arc Diagram were the most appropriate for the type of information I wanted to represent. At this stage I knew what I was aiming for and now it was a matter of figuring out how to craft the diagram itself. Just a fraction of the available diagrams at D3. To begin the process of sorting and organising all of my interests, I first classified all of the data points into distinct groups. I ended up with a total of seven groups, which were Art, STEM, Design, Psychology, Poetry, Concepts, and Other. Once the elements had been arranged in that manner, I started to position them all on the appropriate nodes for the graph. Below I have given a small snippet of how all of the nodes were inserted into my .js file. //Snippet of how I have structured the nodes. //Each group represents a category of interests. //There are a total of 7 groups. Once I had listed all of my interests and turned them into nodes, it was time to establish the connections between them. Each node in this array has a reference number starting from 0. In order to establish a connection between two nodes one must simply enter the reference number of the source of the connection and the reference number of the target node. Additionally, based on how significant each of the interests and connections are to me, I have added a value to each connection, although most of the nodes have a base value of 1. Below I have attached an example of how the connections between nodes look. //This is the basic structure of the linking system. After I had entered all of the connections I found between all of the elements I was left with a complex, but accurate graph representing the different relationships between all of these interests of mine. Based on the number of links between them, there were a handful of categories that stood out and connected with dozens of other elements. The category with the most connections was Mathematics, followed by Art, Geometry and Geometric Rotation, and Poetry. Although I have attached both an Arc and a Radial Arc Diagram, I strongly prefer the Radial Arc Diagram as it is much easier to read through and to see the connections between the separate nodes. Finished version of the Arc Diagram. Finished Version of the Radial Arc Diagram.